Lori and I are at it again. She made me order the Trend Tex Challenge Kit and i got it last Friday. As you can see the fabrics are pretty wild and the theme this year is "Roots". We had a month to brain storm ideas and yesterday drew up our pattern. Our goal it to finish it for the February Guild meeting to so we can show everyone before we say goodbye to it. The Trend Tex Challenges are wall hangings that are donated to the CQA to be auctioned off at Quilt Canada in Saskatoon this year. No, i'm not telling what we are doing, you'll have to wait until i post a picture after the meeting. 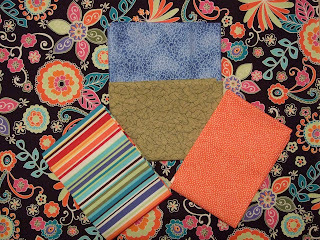 Holy cow - can't wait to see what you do with those fabrics!